In May 2010, there was a photo in the media of South African President Zuma wearing leopard skin at a wedding. The photo prompted a discussion on whether Africans should show the rest of the world themselves in traditional dress, or wearing European clothes in order to "blend in" with the rest of the world, as many Westerners have an unfavorable idea of African tradition. In my view, this would be an error. The problems in Africa do not have anything to do with their traditional ways of dressing. As a matter of fact, some of the leaders one only sees wearing suits and ties are in fact the worst and the most corrupt. 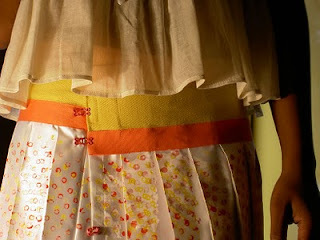 However, traditional dress also has its place and time, and it would be a shame to lose it. There are so many styles all over the African continent that I can only show a few, from my own photos, from Cameroon. The following shows a ceremonial outfit from Bamenda, Northwest Cameroon (near Nigeria). On top is the cap that is worn with it, and a couple of necklaces (from other regions). There are many varieties on this theme, all beautifully done. Here our cousin is wearing an African-style outfit as office wear: it works in a city such as Douala, without a winter and no commuting by subway! the waist and the neck. 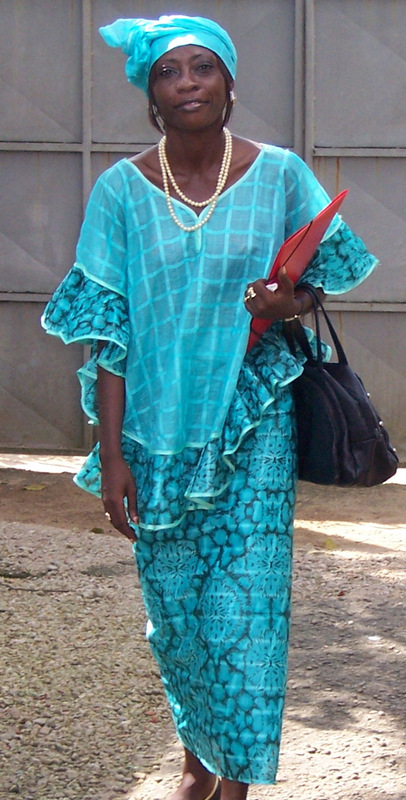 The "official" Duala traditional clothing (since colonial days) is more adapted to ceremonial outings than for work, whether for men or women. 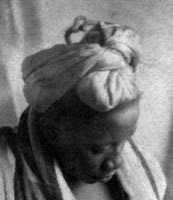 Women's head scarves are often knotted in elaborate ways. Men of course also have their head coverings, such as a variety of skull caps, and the European hat. Duala women wear the kaba since the arrival of Christian missionaries. 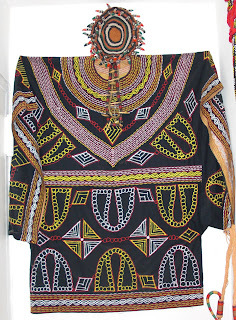 Missionaries in Hawaii created a similar garment for local women, as the original garments offended their religion--I found out about this when reading Mitchener's opus "Hawaii". 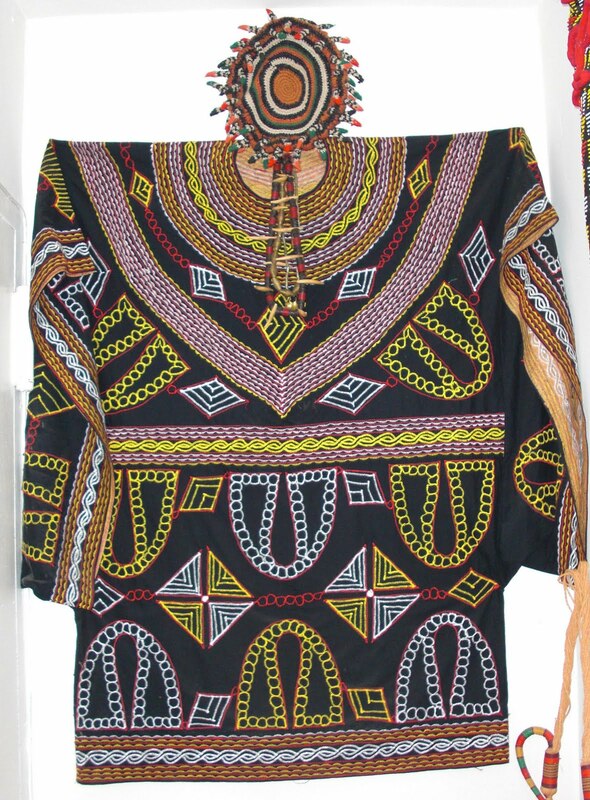 At a funeral or another ceremonial occasion, Duala women of a specific group (neighborhood, political party, family group) will wear kabas in the same fabric. 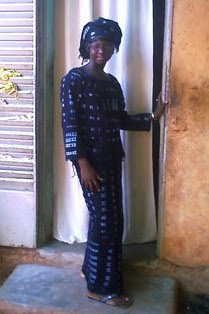 My online friend Boukary Konaté*, whose efforts to teach the use of the Internet in Mali was described in this entry, sent a few images of traditional and contemporary outfits in Mali. 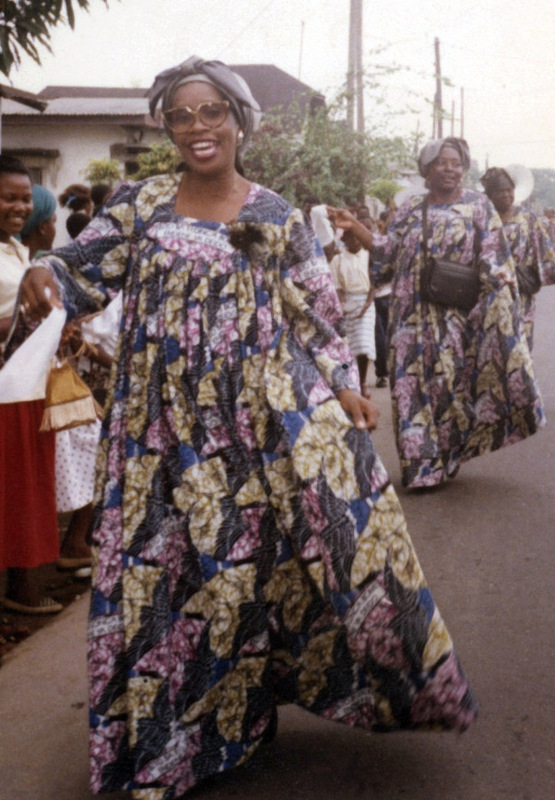 Note the indigo dye in the lady's outfit, typical of West Africa. Mali is especially well-known for its expertise in indigo dye. Africa is a large continent, and I'll attempt to collect more images of the ways people clothe themselves, whether in traditional or contemporary style. Stay posted! 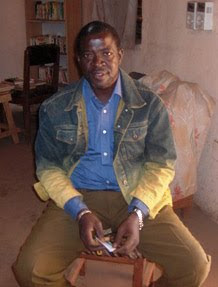 Sad note: Boukary Konaté passed away, far too young. 2018: Made in Africa: Zuri's "One Dress"